PRESS RELEASE – The NGO Fraternity in Iraq signed in July 2017 a partnership agreement with the United Nations Development Program (UNDP) as part of its commitment to the resumption of economic activity of populations from areas, based in Nineveh plain, that have been freed from ISIS. The French Ministry of Foreign Affairs is subsidizing the project. 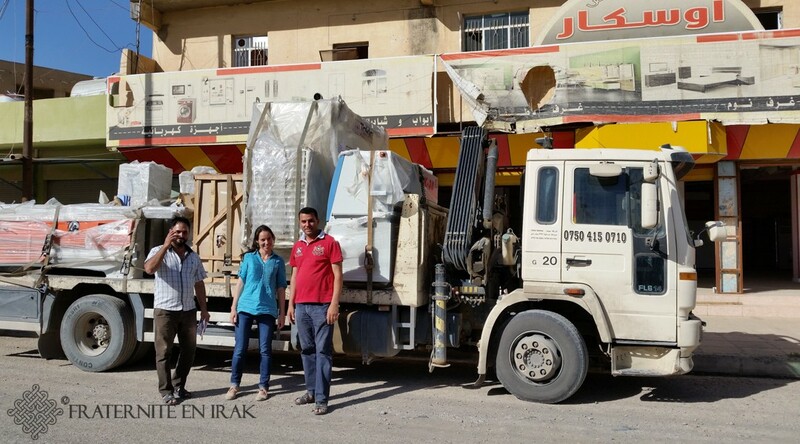 Called “Nineveh Plain Small Business Program”, this program is wholly led by Fraternity in Iraq and funded by the Quai d’Orsay Crisis and Support Center, in partnership with the United Nations, for an amount that may reach $ 250,000 over the period 2017-2018. A first installment of $ 70,000 paid by the crisis and support center of the Ministry of Foreign Affairs has already been added to the current financing provided by Fraternity in Iraq for the resumption of activity of about 43 entrepreneurs, craftsmen, shopkeepers or farmers. Therefore, this enabled to create more than 150 jobs and support nearly 200 multi-member households, even though the subsidy process has only started ten months ago. Dedicated to entrepreneurs willing to revive the business they used to carry out before a forced flight and the extension of ISIS in 2014, the aid aims to support the purchase or rehabilitation of needed equipment and premises through a subsidy accounting for 80% of the requested amount and a zero-rate loan as the 20% remainder. In Iraq, bank loans are almost impossible to be granted in these areas and when so, they hardly exceed a few thousand dollars in return for guarantee. As a result, this action has been especially welcomed. Repayment of loan, by some recipients, that followed the resumption of their business makes it possible to subsidize new applicants and thereby to fuel a virtuous circle and a true momentum. « Responding to economic uncertainty is an important first step forward for minorities of the Nineveh plain who are sometimes reluctant to come back to freed territories where future is difficult to make sense. However, beyond the strictly economic aspect, commercial trades indirectly allow the strengthening of ties among communities. Over a few tens of kilometers in the area, we can find communities of Christians, Yezidis, Kakais, Shabaks or Arabs among whom discussion is a crucial necessity for peace » said Faraj-Benoit Camurat, Chief Executive of Fraternity in Iraq. ← Restauration de Mar Behnam : fin du gros oeuvre !